Going to ChinaJoy this year? Want a handy – and fun – way to meet up with a core of the mobile games industry while you're there? 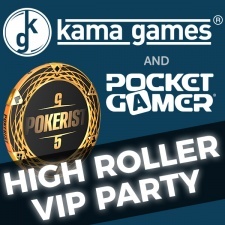 KamaGames and Pocket Gamer invite you to join us and go all in on a night of grade-A-networking, drinks and casino games on Friday, July 28th. Taking place in the glamorous Luxury Living bar, situated on the Bund in Shanghai, from 8pm till late (and following on from The Big Indie Pitch), the event offers a great opportunity to connect with the Pocket Gamer and KamaGames – as well as co-organiser CiGA – teams, meet fellow industry members, enjoy drinks, food, blackjack, camaraderie and generally party the night away. You need to RSVP and make sure you get there nice and early as these events are ultra popular and RSVPing alone won’t guarantee entry.